Keeping to a specific pattern in your life can make anyone restless or bored. Gym, work, dinner, TV, rest gets too repetitive for many of us. Tosha Silver, author of CHANGE ME PRAYERS, tells you how to get out of the rut your in, by trying something new. Back in my twenties, I took classes with a psychic who gave one steady piece of advice. He would say, “Do Something New each day. Even if you just use your left hand rather than your right or go to a different café.” He insisted that by simply doing this, we would reanimate the brain, break patterns, and kick open energy. To this day, whenever I feel stuck or depressed, I use his advice. Once I did this for a week. I finally started that salsa class I’d been procrastinating about for five years, then the next day wrote in the park rather than in my usual spots. I cleaned a certain closet I’d been resisting forever and even took a long-delayed hike up Mount Wittenberg. By the end of the week I was so energized, I showed up at a friend’s party rather than hiding away writing, as usual. It was all so uplifting, and you can see why. Grooves get cut deep into the mind from endless repetition of patterns, so habit can keep us imprisoned in ways we don’t even notice. Sometimes a simple game of “something new” can shift neural patterning quickly. So tie your shoelaces the opposite way. Eat something novel. Talk to someone you wouldn’t normally notice. If you start to think, “I’m not the kind of person who . . . ,” drop that for now. Fixed patterns and identities start dissolving, everything starts unsticking. Find out where the Divine will actually lead you if that wall of resistance isn’t in the way. Prayer: Change me Divine Beloved into One who is wildly open to the New. Grant me the willingness to experiment and play. Free me from rigid patterns that no longer serve. Let me feel adventurous and spontaneous, knowing that the more I open to life, the more it opens to me. Find more uplifting prayers on how to improve your life in CHANGE ME PRAYERS by Tosha Silver. For more on Tips on Life & Love: Should You Try a Mortgage Meditation? 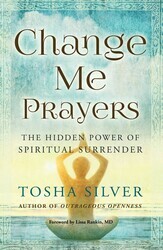 Excerpted from Change Me Prayers by Tosha Silver. Copyright © 2018 by author. Used by permission of the publisher. All rights reserved. Photo by Ben White on Unsplash. From the author of the life-changing book Outrageous Openness: Letting the Divine Take the Lead comes a transformational follow-up book featuring a thoughtful collection of prayers and stories to help you actively invite the Divine into your life.“Change me Divine Beloved into one who can give and receive freely and be a clear vessel for your Light.” Tosha Silver, with her characteristic wit, charm, and mix of passion and humor, shows you how to invite the Divine into your life to create change and transform from the inside out. Covering a variety of topics—from work to finances to self-worth—Change Me Prayers reveals how to truly surrender to a Divine plan in the most joyous and uplifting way. At its heart, this book is a spiritual guide for anyone open to living in union with Love, even in times of difficulty or crisis, and includes a convenient “Change Me Prayers Quick Guide.” Tosha proves to be a profound, unique, and often hilarious guide to awakening. May the Divine permeate every part of your life! Tosha Silver graduated from Yale with a degree in English literature but along the way fell madly in love with yogic philosophy. For the last thirty years she has taught people around the world ways to align with this inner Love. She is the author of Outrageous Openness and lives near San Francisco, where she runs an online school dedicated to these ideas, called “Think Like a Goddess.” Please visit ToshaSilver.com for more information.